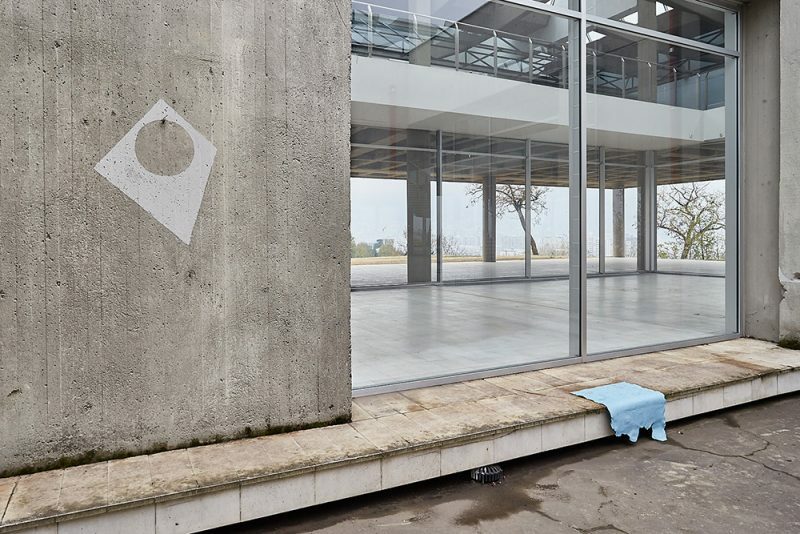 In the age of belated terrestrial awareness and multiple other opportunities and threats foisting themselves upon us daily, the joint solo exhibition by Yane Calovski and Hristina Ivanoska at the Museum of Contemporary Art Skopje may not appear immediately “urgent” (a much-overused term in contemporary art) or “topical” (another term serving as a hurdle for artists). 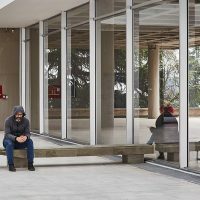 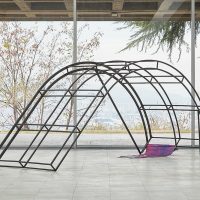 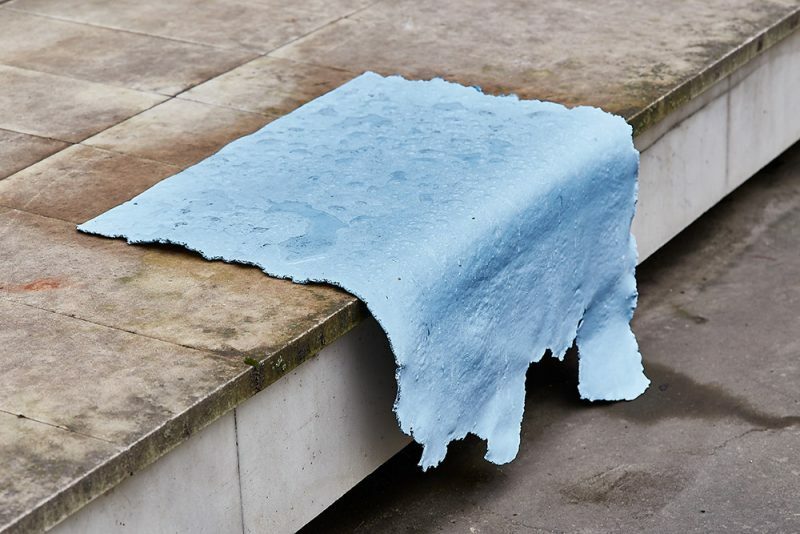 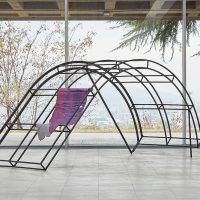 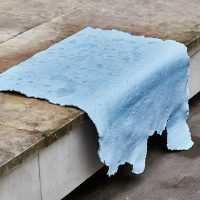 Yet, “Epilogue (A Form of an Argument),” by the duo who represented Macedonia at the 2015 Venice Biennale, is no exercise in art-specific introspection. 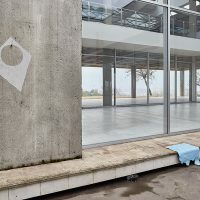 Straddling the visual, the architectural, and the political, it becomes an extension of the museum’s concrete walls and the historical moment they embody: the organized acts of international solidarity to rebuild Skopje after the earthquake that destroyed 80 percent of the city on July 26, 1963. 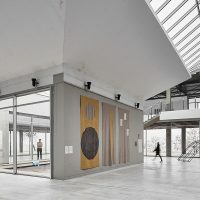 Japanese starchitect Kenzo Tange contributed a new “metabolic” city plan that was only very partially realized (Calovski exhibited the surviving parts of Tange’s exquisite wooden model as part of his installation for Manifesta 7, 2008). 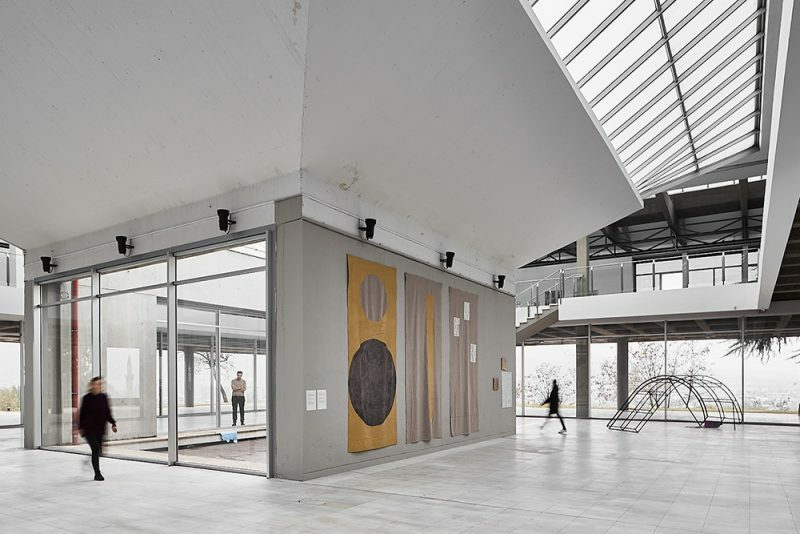 Poland contributed the funds and architectural know-how to build a museum of contemporary art. 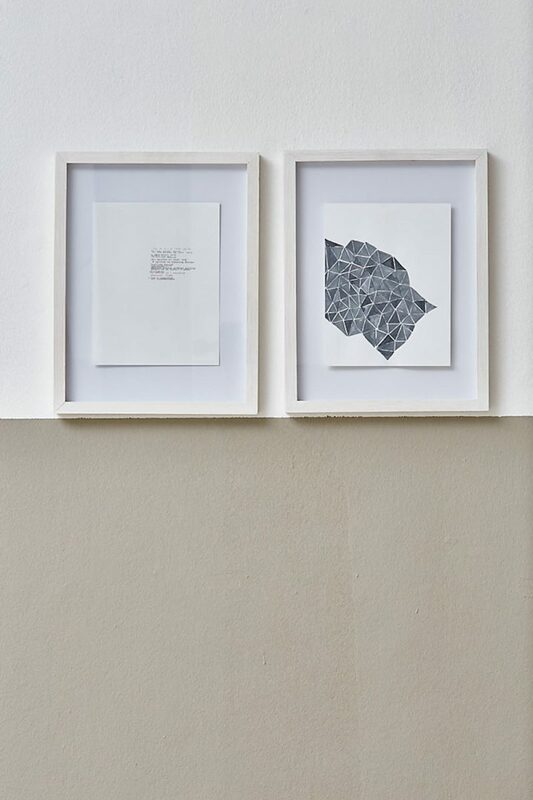 Calovski and Ivanoska thematized one of the architectural proposals for such a museum in their print-based work Oskar Hansen’s Museum of Modern Art (2007): a series of posters for fictional exhibitions that might have taken place in Hansen’s modular cluster of hydraulically manipulated hexagonal platforms, which remained unbuilt. 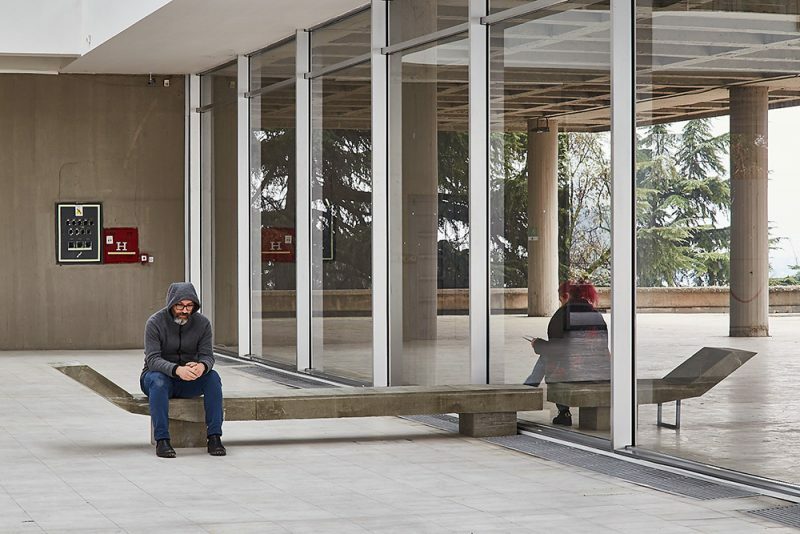 Instead, another building, designed by The Warsaw Tigers, a group of three prominent Polish architects (Wacław Kłyszewski, Jerzy Mokrzyński, and Eugeniusz Wierzbicki), materialized in 1970 on an imposing hill not far from the largely intact Ottoman-era old town. 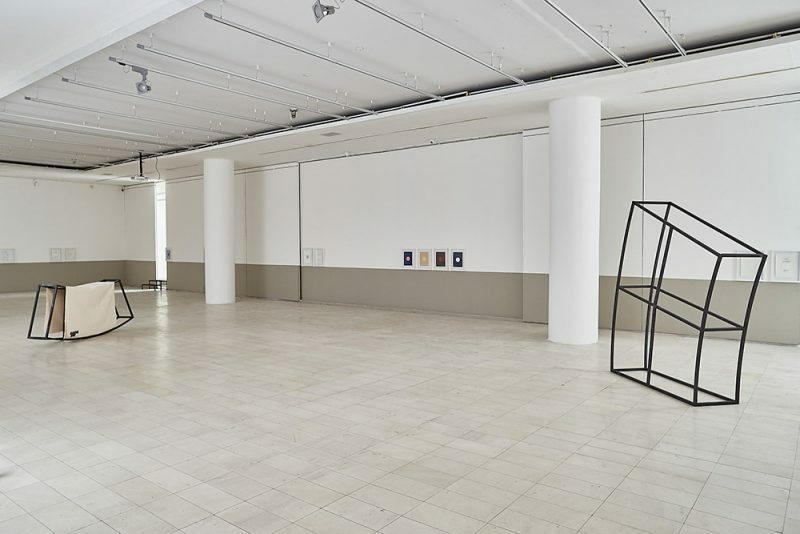 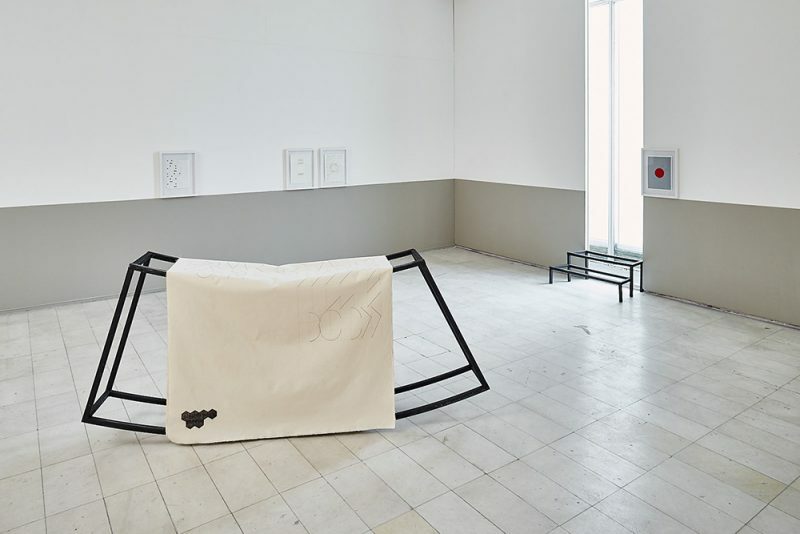 Two of this museum’s three spacious halls now host the conclusion of an exhibition trilogy by Calovski and Ivanoska, curated by Branka Benčić, that also comprised “Prologue (A Form of a Question)” at Apoteka—Space for Contemporary Art in Vodnjan (Croatia) in 2017 and “Dialogue (A Form of an Answer)” at the Museum of Contemporary Art Zagreb, in 2017–18. 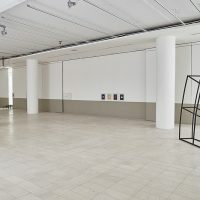 The first hall is another tribute to the author of the museum that never was. 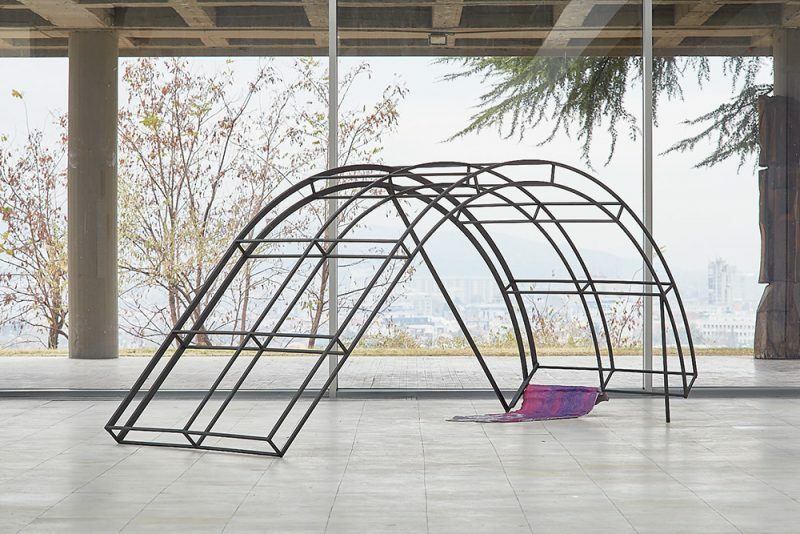 In Nine Principles of Open Form (2018), Calovski and Ivanoska return to Hansen’s work, synthesizing his writings and his architectural and pedagogical practice. 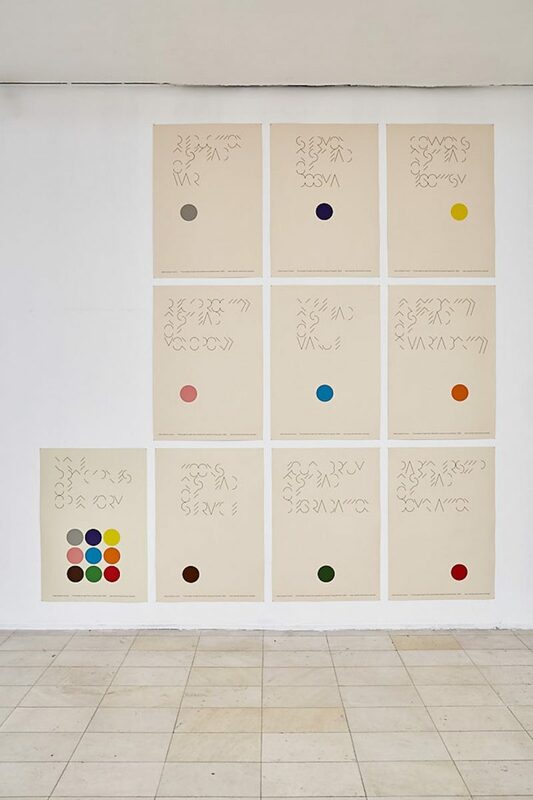 To celebrate his ideas about life as communality and art as organic process, the work combines 10 posters in a typeface designed by Ivanoska (withholding all vertical and horizontal lines and leaving bewildered readers with only diagonals and semi-circles) with a series of “visual exercises” hung just above a 90-centmeter-tall skirting of concrete-gray wall paint. 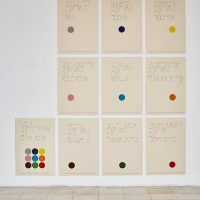 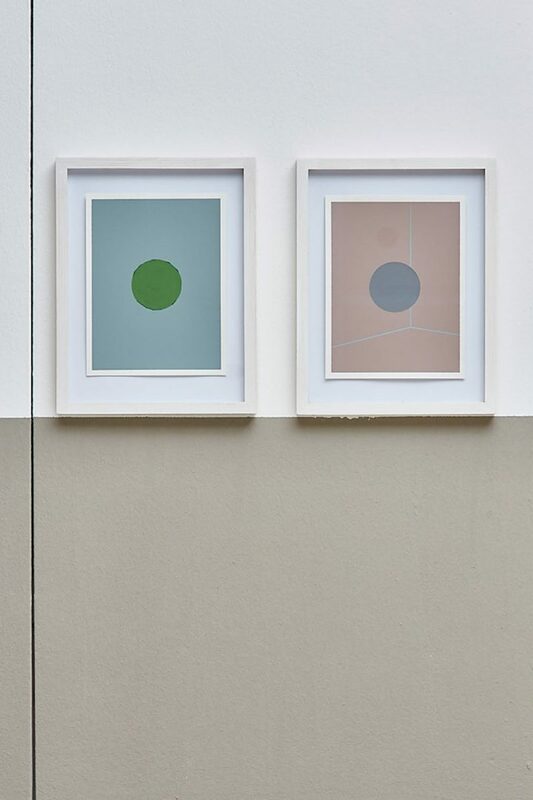 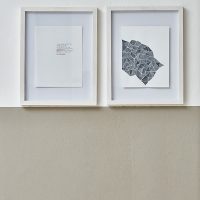 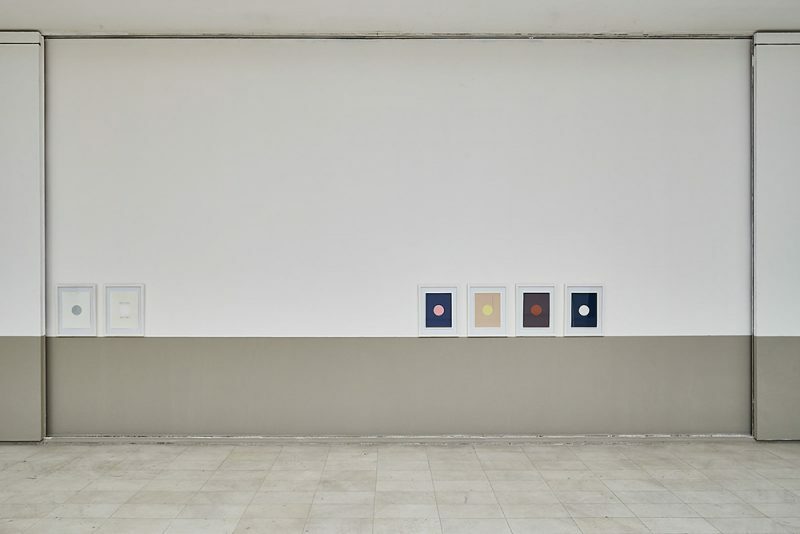 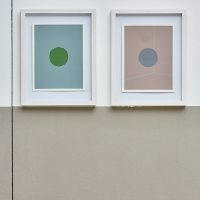 These are mostly Bauhaus-like permutations of colored circular shapes on found colored backgrounds: sheets of luxury paper with fine sand mixed into the printing ink. 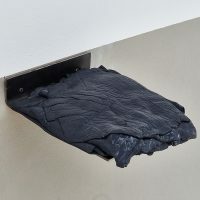 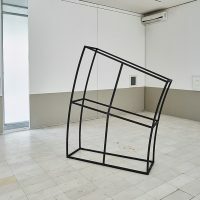 Like the 90 centimeters, the color scheme is a reference to Hansen, to the easily distinguishable nuances he often used for public signage or to mark various functions on his architectural blueprints, The installation also includes three elements from Calovski’s Shell, Divided (2011/2018), a scale model in black-painted metal of a concrete conversation platform by an anonymous architect in Skopje’s City Park, and sketches for the posters executed on linen canvas. 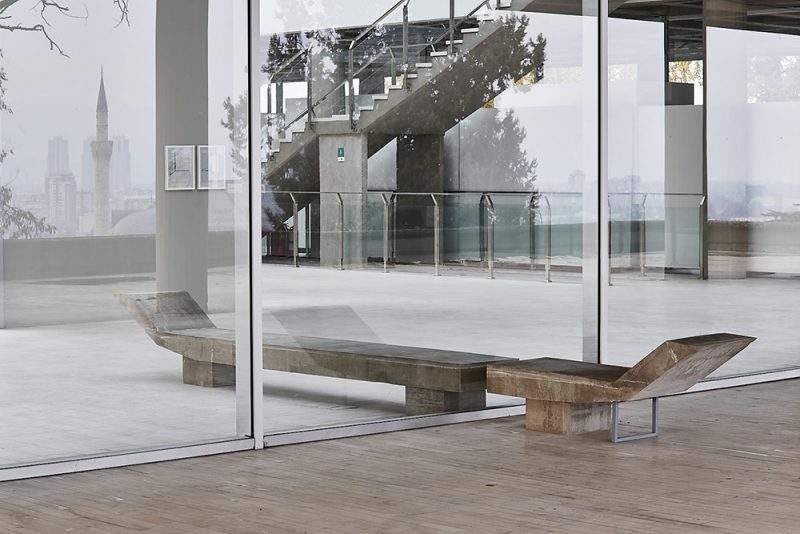 In the second hall, the cityscape beneath the hill is ever present, wrapped in pernicious smog. 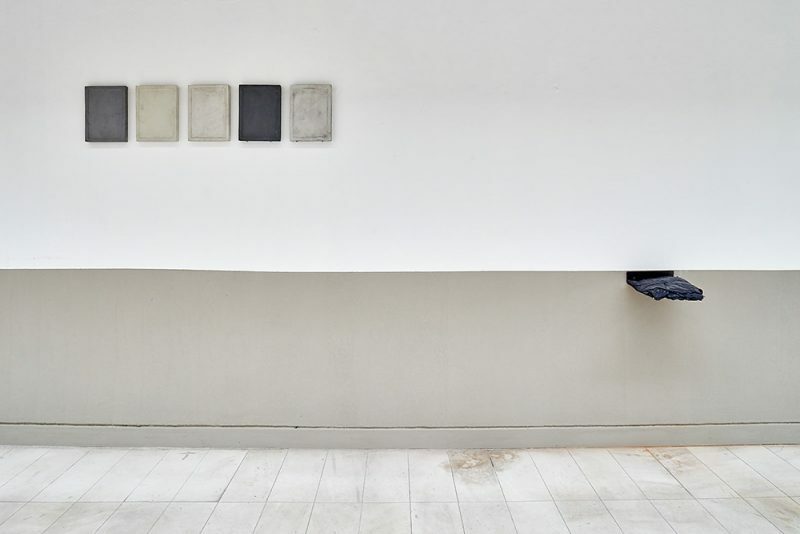 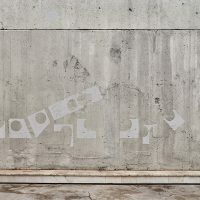 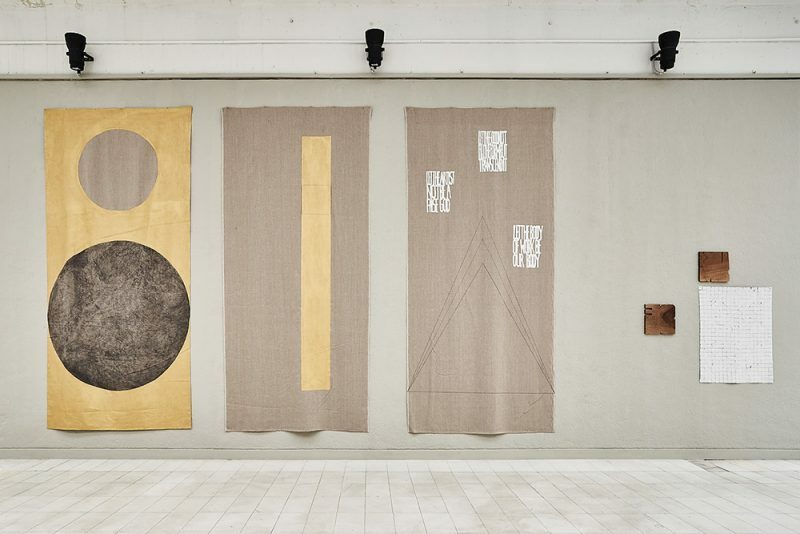 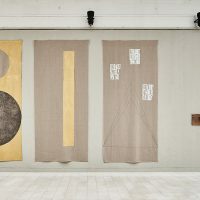 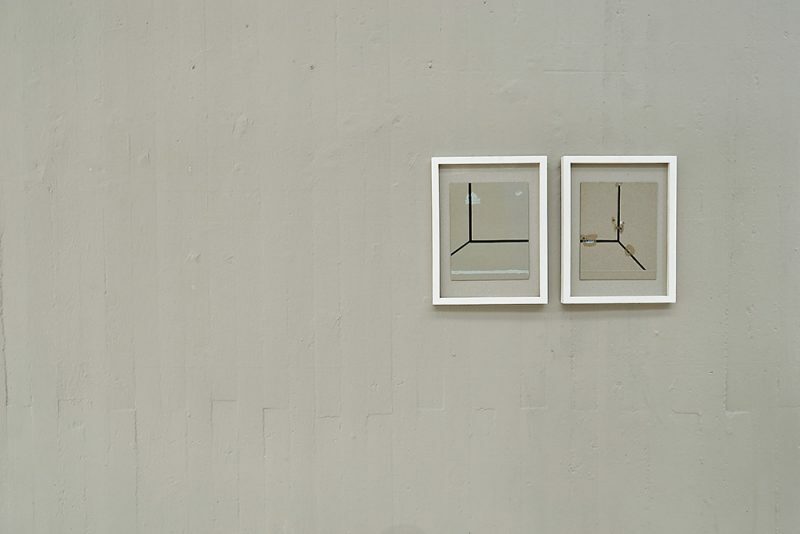 The shapes used for the wall painting Assembly of Spirits (2018, a joint work) congregate on the only concrete surface of an otherwise windowed inner courtyard within the second hall. 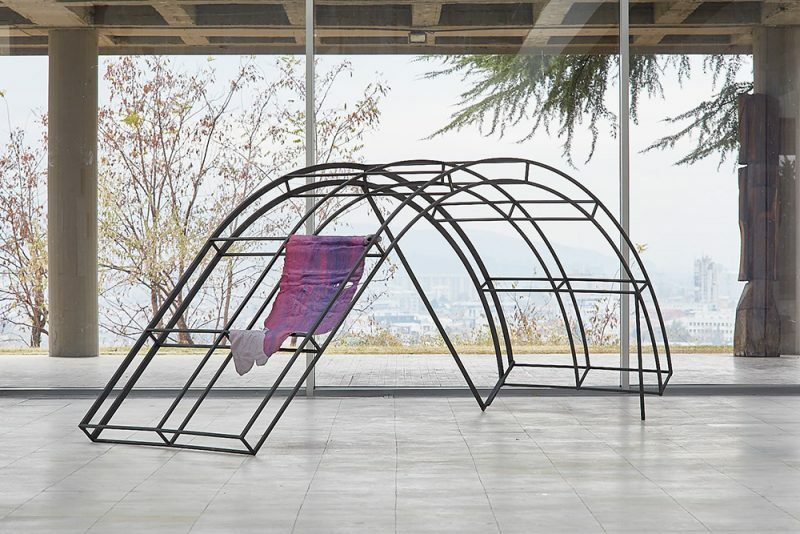 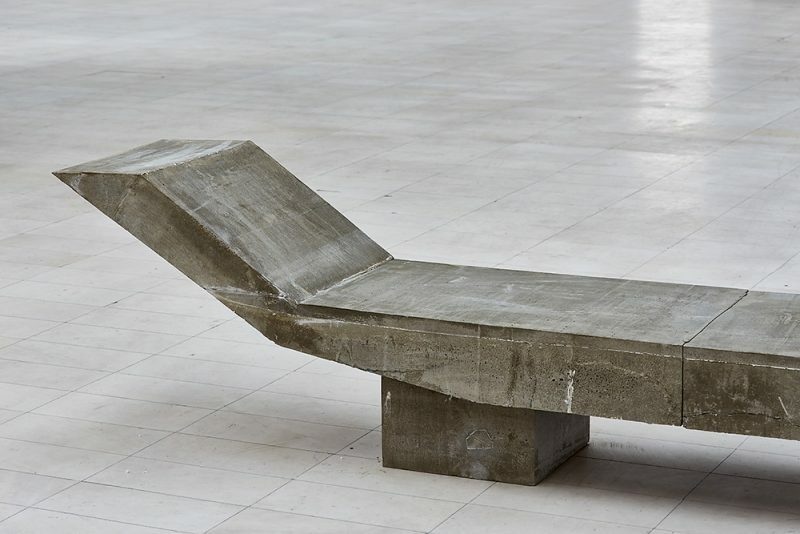 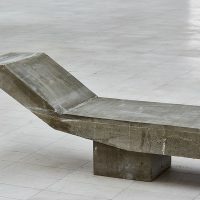 Two thirds of Calovski’s Mulchikoski Bench, Divided (2018), a life-size copy of one of the concrete benches outside Skopje’s once-modernist (but now neo-baroque) Government Building, stand inside the museum, while the remaining third continues outside the floor-to-ceiling wall of windows. 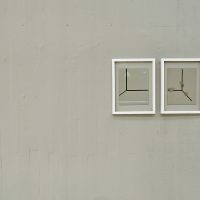 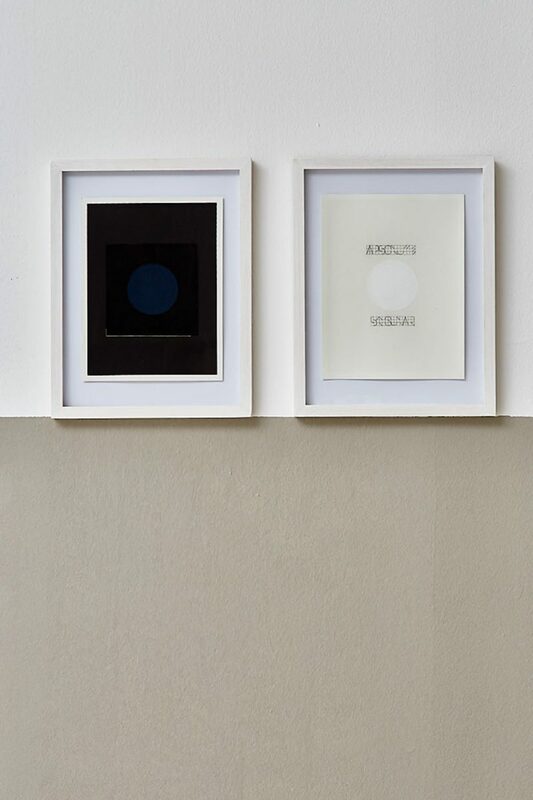 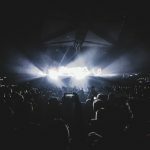 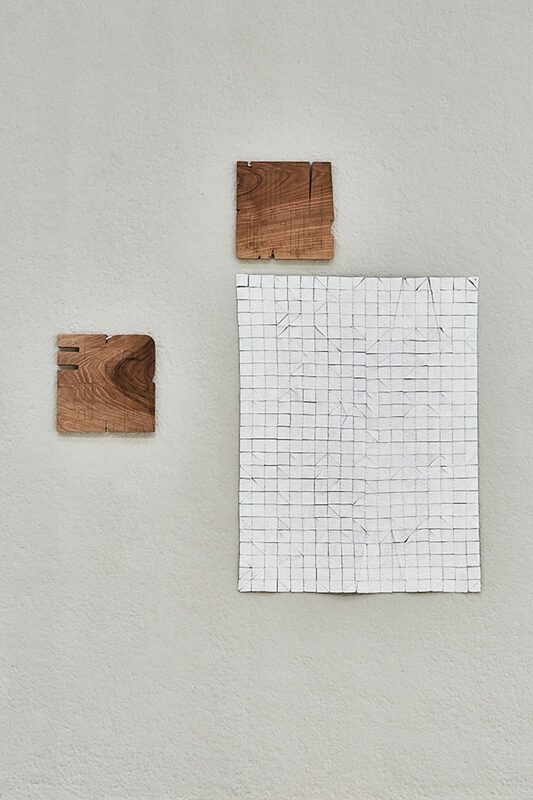 Cross-referencing the observed and the imagined is a leitmotif in the duo’s activities. 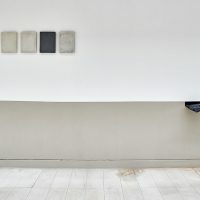 Ivanoska’s Document Missing: Performance No. 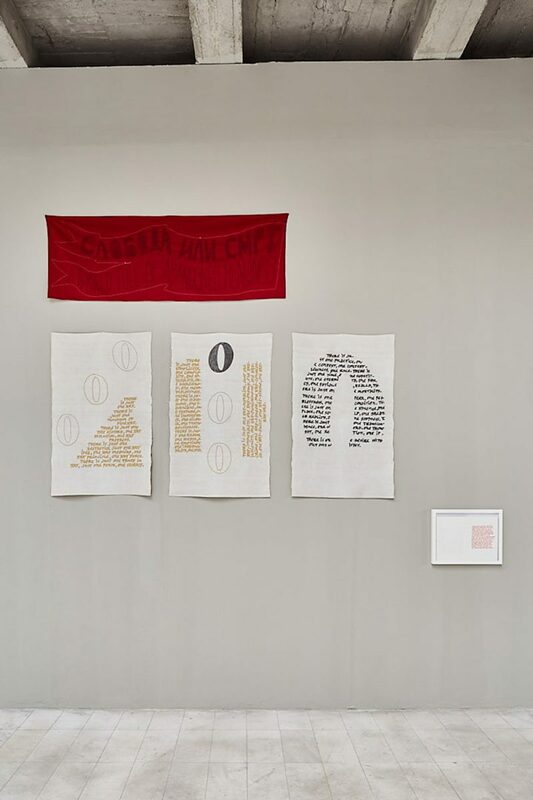 5 (Action Object) (2017) is a red banner reading “Freedom and Death: A World Full of Abandoned Meanings” meant to swaddle the upper body and be worn under clothing as a means of clandestine revolutionary distribution, as early-20th-century Macedonian suffragette Rosa Plaveva used to do. 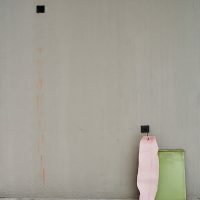 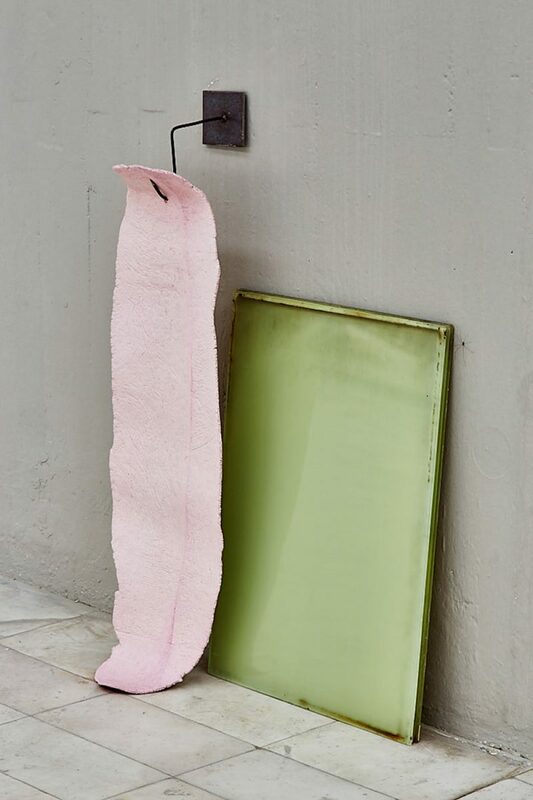 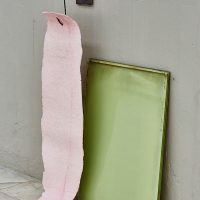 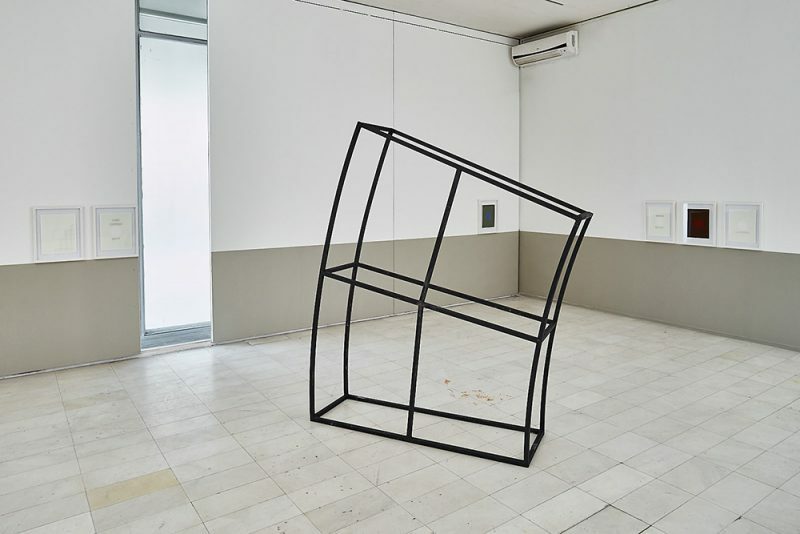 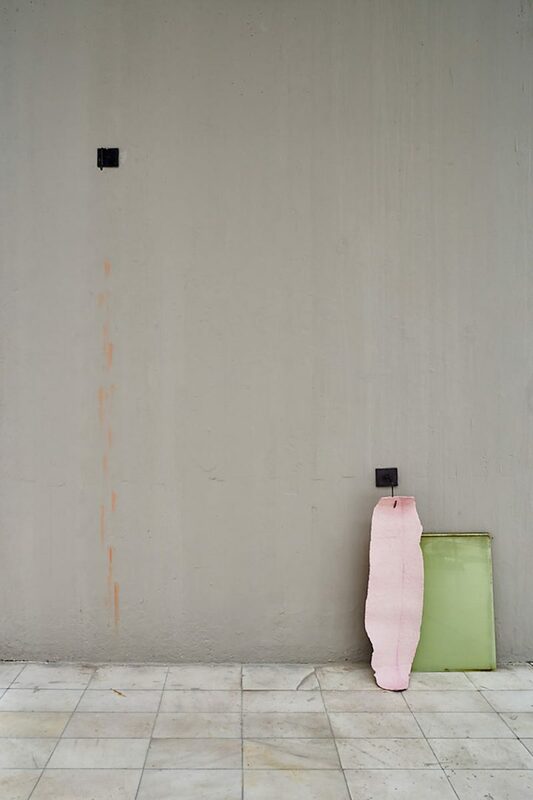 Calovski’s Personal Object (2017–18) is a visually eloquent assemblage of a pink synthetic-rubber “tongue” hanging from one of two black iron hooks, a stack of small green window glass pieces from Tange’s “City Wall” apartment blocks and traces of face powder, from the artist’s late mother’s stash, on a wall painted gray. 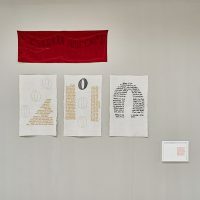 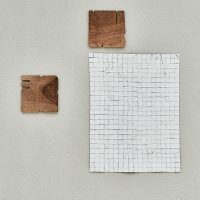 At these and other intersections of the lived and the created there are time- and labor-consuming processes such as drawing or the making of synthetic rubber, but also wood carving (Ivanoska) and the use of old-school analog typewriters to weave particularly meaningful quotes into a pictorial whole (Calovski). 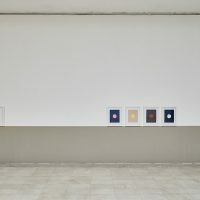 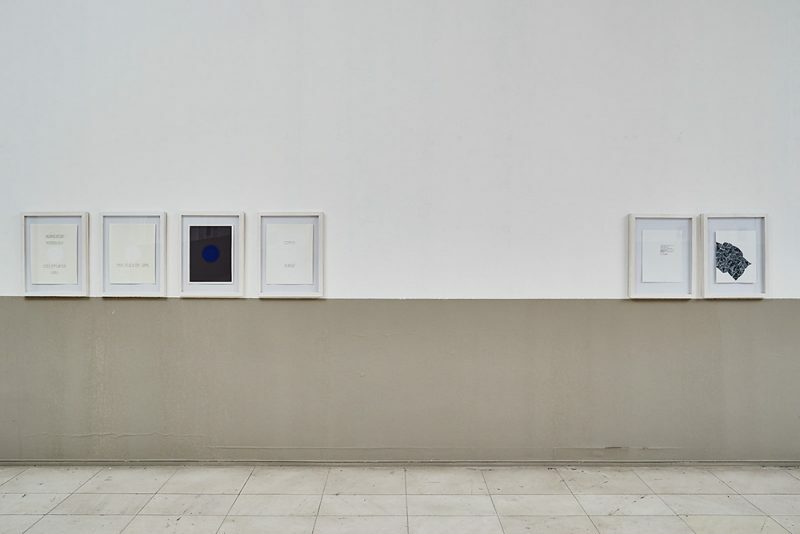 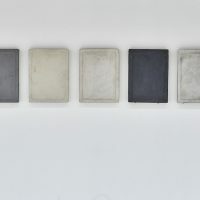 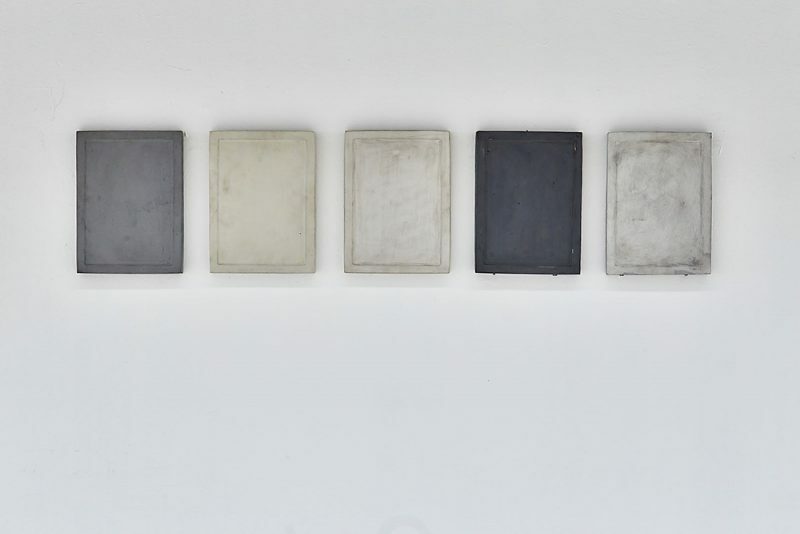 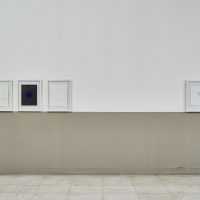 Crucially, this is also the artistic practice of grounding the visual in the textual, of mobilizing the history of the global avant-garde and salvaging the archives of modernism in locations such as Skopje, where they often perish. 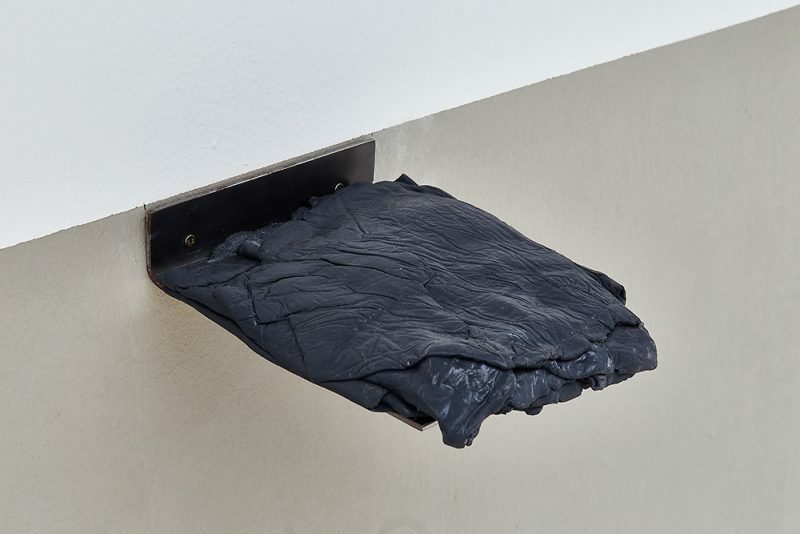 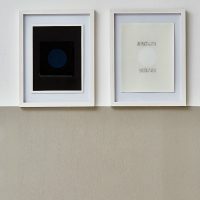 Jointly and separately, Calovski and Ivanoska work through the conditions of art, always with the intention and desire to touch something on the other side of the wall or the window. 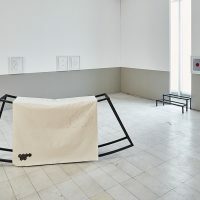 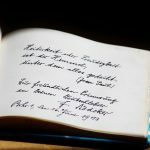 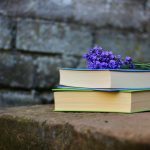 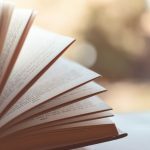 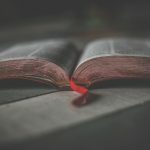 It is as if they want to help art overcome itself by concentrating on everything that is specific about it: material, production process, the story and history of the place it inhabits and of art as a protocol of knowledge, understanding, and attitude.